World-renowned experts for orthopedic revisions and musculoskeletal oncology will lecture on the latest technology and techniques, allowing ample time for group discussion. 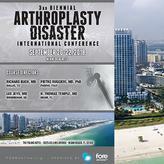 Attendees will discuss, debate, and come to a consensus on the best ways to treat these complex cases. The course has been designed to discuss not only the "good" results, but the worst, most difficult cases and problems we all face. Our bad outcomes or "DISASTERS" concept is a simple one: we all learn more from our mistakes. This course is open to Physicians, fellows, senior residents, and other healthcare professionals that see, treat, or have an interest in orthopaedic reconstruction, musculoskeletal oncology, and infection cases.